Weather-proof tether lid. T connector makes wiring easy. This high quality socket requires a 1.125" hole. Top flange is 1.510" diameter & requires 1.75" behind the panel. Comes with a matching plastic jam nut for mounting. We understand that many riders prefer the common cigarette type socket found in their automobile. So Powerlet has designed these kits using the tightest fitting cigarette sockets available. However, even with a tight fitting cigarette socket typical vibration found on the panel of many powersport vehicles can cause an automotive cigarette type socket to loose power. Made from the highest quality materials, these kits come complete with 14AWG 105C wire, special 105C tubing and the highest quality socket available. All components are UV stable and are oil/gas resistant; translated - they will not deteriorate over time. 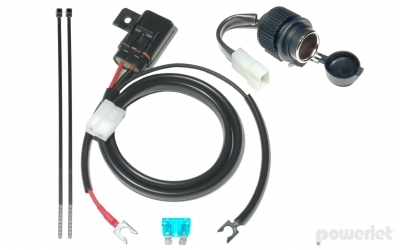 The fuse-holders are waterproof and use standard ATO style fuses. The terminals are highly annealed copper. Everything you need is included right down to the ty-wraps.